Lake County Eye: Bill Gentes running for third term. Got a press release from Mayor Bill Gentes today announcing his run for his third term. Gentes ran for State Senator Bill Peterson's open senate seat last fall and got beat quite handily by republican newcomer and now State Senator Dan Duffy. Scuttlebutt has it that Gentes is toast in this election, but looking at the County Clerks website from the November election you can see Gentes won the Round Lake precincts pretty consistently (looks like he lost 1 of 10). There is a slate already announced (posted here on December 27) so its a two way race for the Round Lake Mayor's seat (for now). My guess is that Gentes wins. Plus I have been hearing from Republican sources that there is a third slate gearing up to run as well. 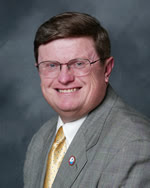 Two term Round Lake Mayor Bill Gentes announced his intention today to seek a third term as Mayor of Round Lake. Mayor Gentes is running on his record of improving management of the village, professionalizing the police department, and building a surplus in reserves from $5 million dollars to well over $16 million today. In addition Mayor Gentes serves on numerous boards and committee’s including Chairman of the 120 Corridor Planning Council, which hopes to build the 11 mile road across the county to solve many of our transportation problems. Running with Bill on the United Round Lake Party is current Village Clerk Jeanne Kristan, Village Trustee Brian Brubaker, current Round Lake Police Commissioner Al Villasenor and Cynthia Purim Haran. “I am pleased to say this slate balances and represent all the areas of the village from the older sections of towns, to some of our larger less represented developments. I am very excited to be running with this fine group,” says Bill. “The village has become a much more complex entity in the last years, as the vast amount of development approved by my predecessor was built during my first term. We had to manage explosive growth and increased service demands with little in the way of management structure in place. I am proud to say that we have done quite a bit of this, but more needs to be done, which is why I am seeking a third term as Mayor,” says Gentes. “My running mates are professionals who have either helped the village progress over the last 8 years, or will help going forward. The two newcomers to elected office are Al Villasenor a small business owner who runs a Financial Services Company and Cynthia Purim-Haran an Attorney with senior management experience as well. I think the village will be well served by this slate of candidates,” says Gentes. Round Lake has grown from 5,400 people in the 2000 census to just fewer than 17,000 according to recent projections.